If you don’t want to be reminded of the real world at all when you’re away in the mountains, then a catered chalet is the holiday option for you. The chalet staff will wait on you hand and foot (within reason!) as they cook you breakfast each day, bake cakes to welcome you back from the slopes, and prepare a magnificent feast for your evening meal. 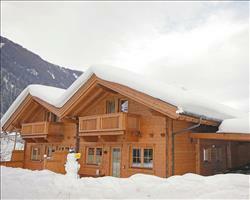 Unfortunately it doesn’t seem that we have any chalets available in Finkenberg at the moment. If you’re still keen to stay here though, check out our hotels in the area. Alternatively, you’ll be able to ski the same terrain from the neighbouring Mayrhofen- you’ll also be able to enjoy some of the best après in the Alps! The Chalet St. Lukas is a lovely traditional chalet, that’s large enough for you to make some new friends, but you’ll also be able to enjoy your own space throughout the week. Larger chalets give you a chance to meet new people to ski with over the week, and if you book sole occupancy of a smaller one you’ll have a lovely intimate trip. Catered chalets needn’t break the bank either- when compared with the overall costs of self-catering and dining out for the week they can often come out on top- especially if you’re staying in a chalet with complimentary wine at dinner!